Get Them Back Home Now! Dallas Bail Bonds are our specialty! Southern Bail Bonds is the only Bail Bonds specialists you need for Bail Bonds in Dallas, TX. We’ve been in the Bail Bonds industry for years in Texas. Our professional Dallas County Bail Bonds Agents provide efficient, courteous, and most importantly, QUICK processing in your time of need. When you’re looking for a Dallas County Bail Bondsman, let Southern Bail Bonds in Dallas help alleviate the stress. 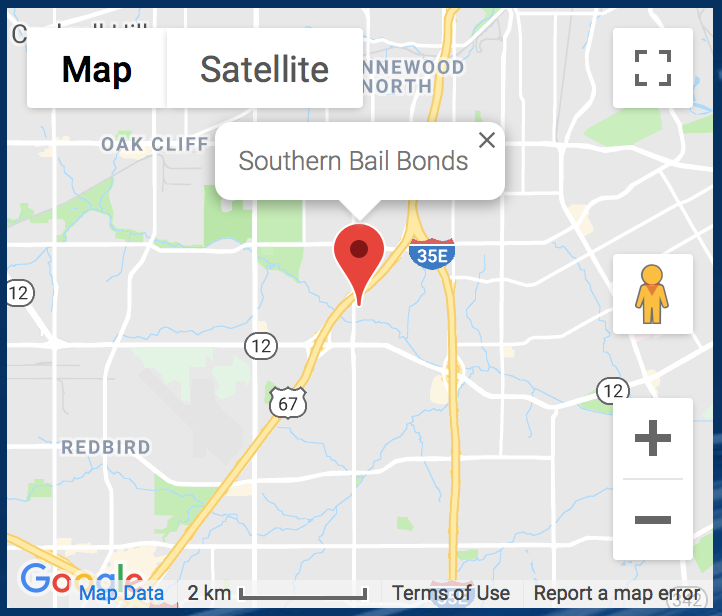 Are you asking yourself where to find the best bail bonds near me? By landing here we think you are in luck! We are a top rated local bail bonds agency. Contact us today – we can provide assistance in getting the answers you need. Conveniently located just off Hwy. 67 and Polk St. in Dallas, TX. Loved One Arrested? Call Us – We Can Help! Did your loved one or friend get arrested on traffic warrants, excessive speed or DWI? We handle those too! Southern Bail Bonds in Dallas can provide you with traffic related Dallas County Bail Bonds. Don’t just sit in jail – call us! We’re available 24 HRS a day, so call us any time for all of your bail bond needs. We Often Say “Yes” When Others Say “No”! How Much Do Dallas Bail Bonds Cost? First, when you chose to use a bondsman you only have to pay a percentage of the total bail amount. Contrary to popular belief, the cost is not always 10%. It can vary anywhere from 7% to 15%. It will depend on the type of bond and of course, the bonding company you choose. For example, if the bail amount is $15,000, you could pay anywhere from $1,050 to $2250. This is called a Premium payment. This is a much more appealing option for most people than having to pay the full $15,000. Fact is, most folks just don’t have that kind of money sitting around. The premium payment is the bail bond company’s payment for posting the bail for the full amount of $15,000. 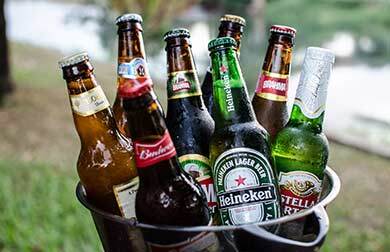 The premium is considered fully earned when the defendant is released from jail. As long as the defendant stays in good standing with the court and the bail bond company, no other fees should be required. If however, the defendant fails to comply with the bondman’s and the court’s requirements (timely check-in’s, timely appearance to all court dates, etc.) the bond agent may forfeit the bond. If this happens then the defendant and the co-signer will be responsible for the full amount of the bond ($15,000) and any costs related to placing the defendant back in custody – like bounty hunting fees and court costs. Most bonding companies will require the bail bond premium to be paid in full before the bond is posted. 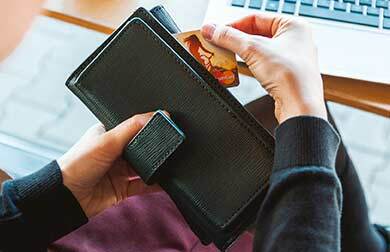 Payment can be made by cash, credit or debit cards or a combination of both. If you are not able to pay the full amount up front, Southern Bail Bonds will work with you to come up with a payment plan that you can afford. We try our best to make the process as easy as possible. Once payment terms are agreed upon they are documented in writing and include a payment schedule so you know exactly what your balance is and when payments are due. We will give you copies of all documents you’ve signed, and if you misplace your docs, just give us a call. We’ll be happy to provide you with additional copies. Our customers know we go the extra mile when helping their loved ones get released from jail and back home to their families. We explain the jail release process but sometimes family members are anxious, even after they leave our office, so we may get additional phone calls while the defendant is being processed out. This is understandable and we don’t mind at all. This happens especially when someone is being released from Lew Sterrett. Mostly because it is the mail jail for the County so the number of people being processed is higher. We answer every question and try to put the family at ease about their loved one and the bail bonds process. Need Dallas Bail Bonds Financing? At Southern Bail Bonds Dallas, we know cash for Dallas Bail Bonds can be a major issue for anyone trying to round up bail money for a family member or Loved one. That’s why every day we work with families to come up with the best and most convenient financial arrangements to get their Loved ones out of jail as quickly as possible. We offer the best affordable Dallas Bail Bonds with easy financing and no credit checks. Many of our bail bonds require no collateral. We have instant approval on many bail bonds. How important is finding the right Dallas Bail Bondsman? VERY! Throughout the bail bonds process, Southern Bail Bonds Dallas does more than just provide a bail bond to our clients. We strive to alleviate stress and provide that well needed peace of mind – with our professional bondsmen ready to assist you 24/7, we are able to deliver immediate, courteous service. Our agents will treat you with the upmost respect, and we uphold complete confidentiality throughout the entire bonding process. Our customer service is second to none. We won’t waste your time with a lot of idle chatter. We work diligently to get you in, processed and out as quickly as possible so you can get back to your business. Southern Bail Bonds Dallas has established a strong reputation for being trustworthy, with no slick tricks, gimmicks or extra fees. We strive to provide the best service possible to everyone who contacts us. We also stay abreast of current events in the bail bonds industry. So whether you need Dallas Bail Bonds or bail bonds throughout the state or even nation-wide, we’re the ones to call. Our core business values are no different from our core family values; we will treat you exactly the way we want to be treated. 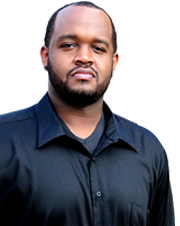 We will take the time to walk you through the entire Dallas Bail Bonds process. We will explain all the details, and answer any questions you may have. We’ll explain what you can expect when you co-sign for Dallas Bail Bonds, and we’ll go over our processing times (which are some of the shortest in Dallas, TX). Let Southern Bail Bonds in Oak Cliff help you with your warrants . Whether they are Felony, Misdemeanor or Traffic related warrants, our bondsman can help. Most warrants can be handled over the phone. Don’t ride around looking over your shoulder any longer. We can assist you with resolving your warrants in a timely manner. Looking for Bail Bonds in Dallas, Texas? Southern Bail Bonds can help! Did you know that the right to bail bonds isn’t something that’s decided by Dallas County. The right to bail is a constitutional amendment. That’s right! Bail is guaranteed by the 8th Amendment of the U.S. Constitution! You have the right to be out of jail while you are working on bringing your case to a successful end. Southern Bail Bonds can help you and your family with fast jail release by providing bail bonds in Dallas, TX at a great rate by our professional agents. We provide bonds for White Collar crimes, drug crimes, DWI domestic violence and many more types of offenses. Our Dallas County Bail Bonds Agents Get Things DONE! Did you call another Dallas County Bail Bonds company first? Did you go to a different company, complete their paperwork, pay the bond fee and hours later they STILL haven’t posted the bond? Did they wait until you called back to ask why your friend or Loved one is still in jail, even though it’s be 6 or 7 hours since you paid for your Dallas County Bail Bonds -only to be told that you needed another co-signer? Does any of this sound familiar? We may still be able to help! Let us re-process your bond. If we give you approval, then we can post your Dallas Bail Bonds within minutes, not hours! Call us today! We’ll take it from here. Need to know the visiting hours and regulations for visiting inmates at Lew Sterrett? Use this link to get the visitation schedule. Also, be sure to review the rules for visitation to make sure you are in compliance before you go. Watch testimonials from some of our happy clients! Find local personal loan and payday loan companies. Additional financial partners.